DLT self propelled transporters are custom designed for the specific requirements of each project, with careful consideration given to the support requirements of the load and the effect of the transporter tyre loads onto the supporting surface below. A typical application is to transport heavy precast concrete bridge deck beams from a casting yard to the final erection location, travelling over a mix of compacted ground, ramps and the previously erected bridge deck. We are able to design and supply self propelled transporters to move any type of heavy load, with pay load capacities per 4-tyre axle line ranging from 20 tonnes up to 130 tonnes. Our transporters comprise a strong steel frame supported on an array of hydraulically linked suspension points. Each suspension point has two tyres mounted on a steerable linkage arm with hydraulically controlled height adjustment. This arrangement allows the concentrated loads from the object being transported to be evenly distributed along any number of axle lines and for all the tyres to remain in good contact with the ground at all times, even when travelling over uneven surfaces. Each suspension point can be independently steered to allow the transporter to move in any direction and around any plan curve. Each transporter is supplied with a diesel engine driven power unit which provides all the hydraulic and electrical power needed. The wheels are driven using hydraulic motors mounted within the wheel hubs and a separate fail safe mechanical braking system is also fitted. The driver can sit in a cab mounted on the transporter, or can walk alongside using a radio control unit. 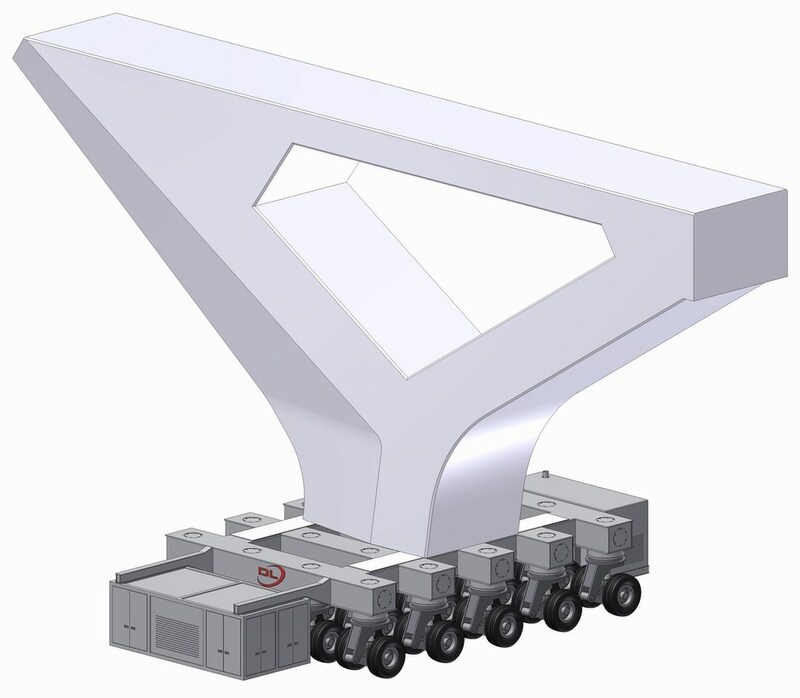 Multiple transporters can be centrally controlled and synchronised. Copyright © 2015 Dorman Long Technology. All rights reserved.